Authorized Agent of - Offices, Apartments, Independent Houses, Farm Houses, Villas, Commercial Show Rooms, Gated Community Constructions. Residential Plot, Residential House, Multistorey Apartment, Builder Floor Apartment, Villa, Commercial Land, Commercial Office Space, Commercial Shop, Commercial Showroom, Kiosk, Hotel, Hotel Sites, Guest House, Business Centre, Warehouse/Godown, Industrial Land, Industrial Building, Industrial Shed, Agricultural Land, Farm House. 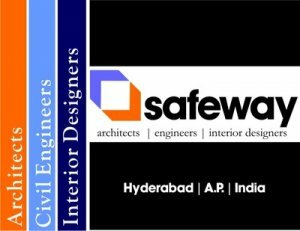 Safeway Architects, Engineers, & Interior Designers in Hyderabad city are specialized in architectural planning & designing services of landscapes, buildings, residents, offices and showrooms. Also provides interior & exterior decor services. - Our team is consist of well-experienced engineers, architects and cad operators - Our experienced architects and staff will help you build your dream home -We proide construction service for Offices, Apartments, Independent Houses, Farm Houses, Villas, Commercial Show Rooms, Gated Community Constructions. Our Services Interior Design Architectural services Corporate interiors Modular kitchen Civil work Landscaping Ceiling Flooring, Paint and other construction related works Building contractors - We undertake old flats & buildings renovation, new houses construction on contract basis. We undertake any type of civil works building constructions on contract. Past Projects: Offices, Apartments, Independent Houses, Farm Houses, Villas, Commercial Show Rooms, Gated Community Constructions.